Thread Description:Updates and photos of my beautiful boy Skye. So apparently Skye is actually a boy (luckily it's a unisex name, haha). I will be posting photos and stories about my beautiful boy Skye. Great that you made an ongoing thread . Looking forward to seeing! It's been a while since I've posted anything here. I'm very proud of my little boy, he will reliably eat seed from my hand in the cage now and occasionally perch on me too. I got a new toy for him today, and I think it might become his new favourite. He insisted on talking to it before he went too close (including mumbling "brave birdie" to himself haha), but is happily nibbling and tugging on it now. So adorable . I love those little shoe toys. Make sure to monitor it for loose strings. That’s so funny he said “brave birdie” before going close . Sounds like you’re going to have a little talker! 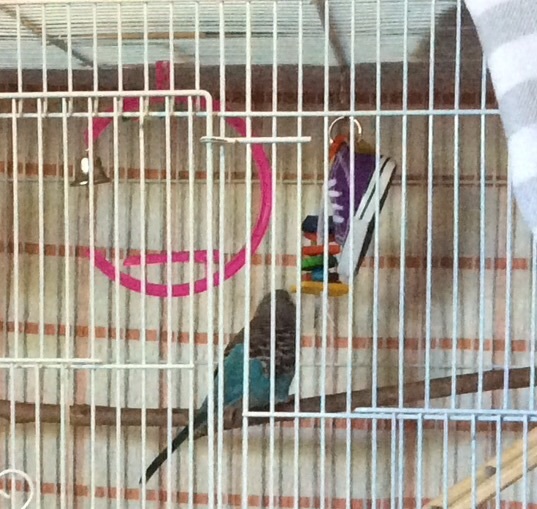 I love that Skye told himself he was a "brave birdie" before checking out his new shoe toy - that's awesome! he is adorable. 'brave birdie' - I love it!! He’s so cute as his his little toy. 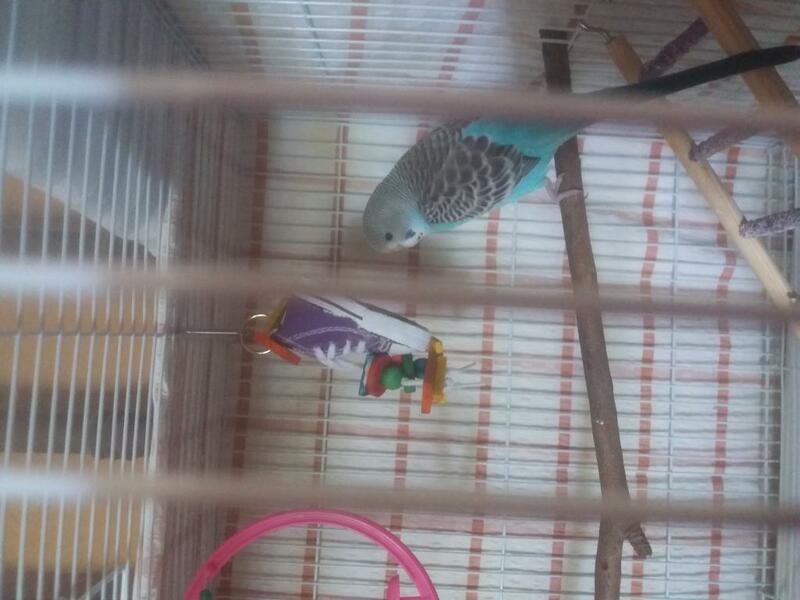 We have the same toy but without the beads and my birds love it! It’s awesome that Skye gave himself a little pep talk, calling himself a brave birdie before checking out the toy. What else can he say?? Thanks everyone, he is a clever little boy. I think he will be a talker too. He has now dragged the swing across so that he can sit on it & nibble on the shoe at the same time haha. He's not technically 'talking' yet, it's kind of at the stage where you can tell what he's trying to say but it's not clear English. So far he tries to say "pretty birdie", "brave birdie", "good girl", "pretty girl/boy" (either one ) & " -- doing?" (I ask him "What are you doing?"). I'm trying to add "budgie bedtime" and "baby bird" to that list. Although, I swear I heard him say "ball of fluff" yesterday (I call my dogs 'ball/s of fluff' sometimes). He likes to screech excitedly when the dogs are barking at something as well, which I find hilarious; it's like 'yes! noise, I can be noisy too!' haha. Just a quick update on Skye. We're making slow but steady progress in hand taming, which is good. He will perch on my outstretched finger if I hold it still in the cage for a couple of minutes, and sometimes 'preens' my hand and fingers. He has also discovered the joys of millet, haha. This will hopefully make training easier now that he recognises the millet as food. He is getting better at talking too, but is yet to learn any new phrases. His favourite word at the moment is 'bird', although for some reason he draws out the 'I' so it sounds more like "biiird". 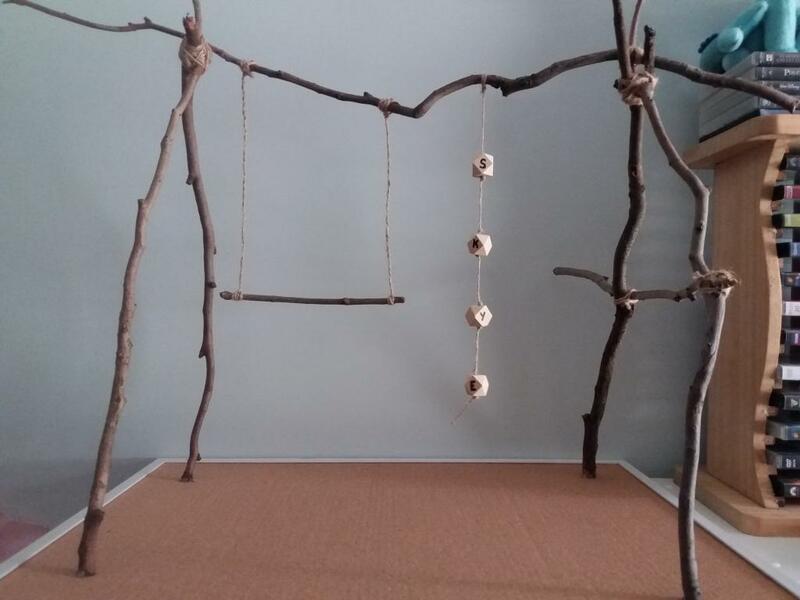 I finished making a play gym for him too, using a cork board as the base, eucalyptus branches and hemp rope to tie it all together. It will only be used under supervision, so I can make sure he doesn't eat the cork or the fibres from the rope. My iPad won't let me attach more than one photo in the same post but I'll add a couple more below. He's starting to look more like an adult already, at least to me. Last edited by FaeryBee; 03-02-2019 at 07:02 PM.